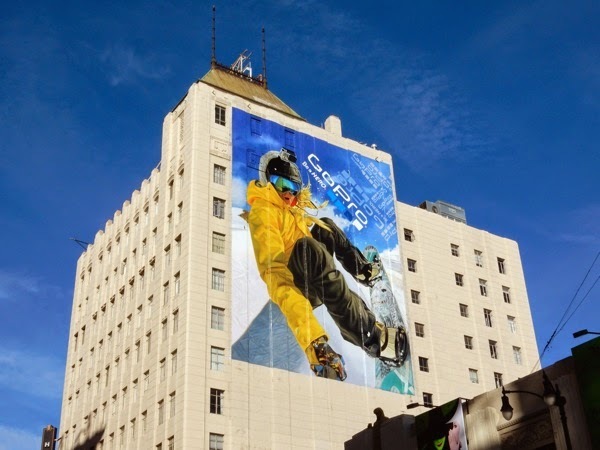 Daily Billboard is fast discovering there's a story behind every ad, be it the one the brand wants to communicate or the context behind the billboard. 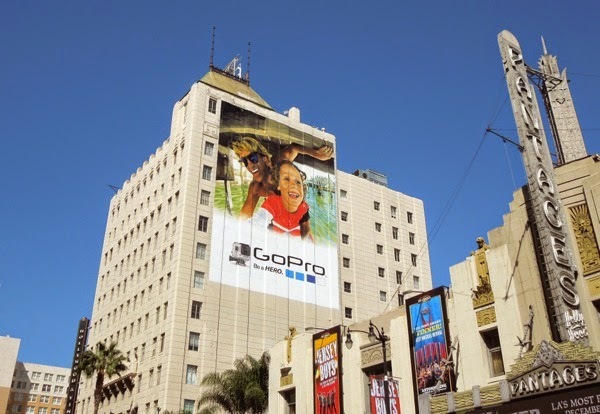 Take for example this super-sized billboard for GoPro camcorders spied in Hollywood above the Pantages Theatre on July 13, 2013. 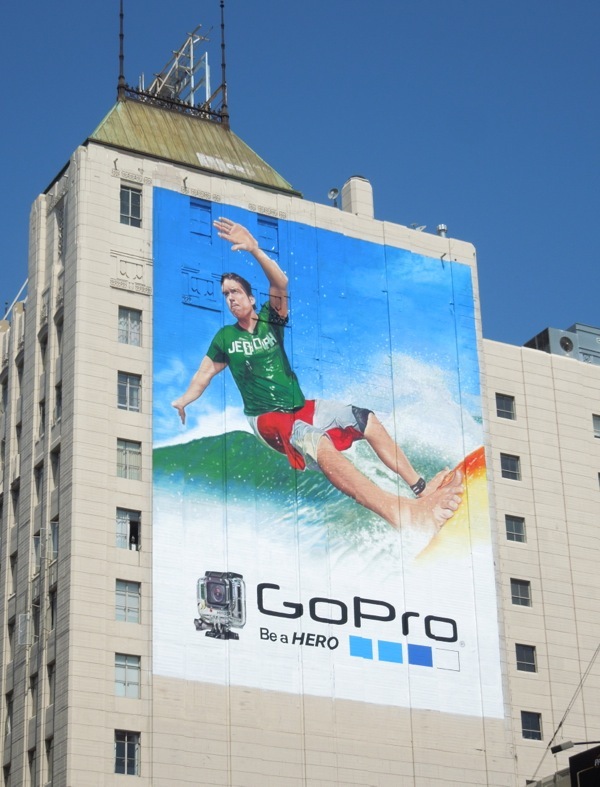 That's GoPro founder and avid surfer Nicholas Woodman, who recently became a billionaire when Taiwanese electronics manufacturer Foxconn bought an 8.88% share in the extreme sports video camera company, Woodman Labs (feel like investing in an up-and-coming website Mr. Woodman?). 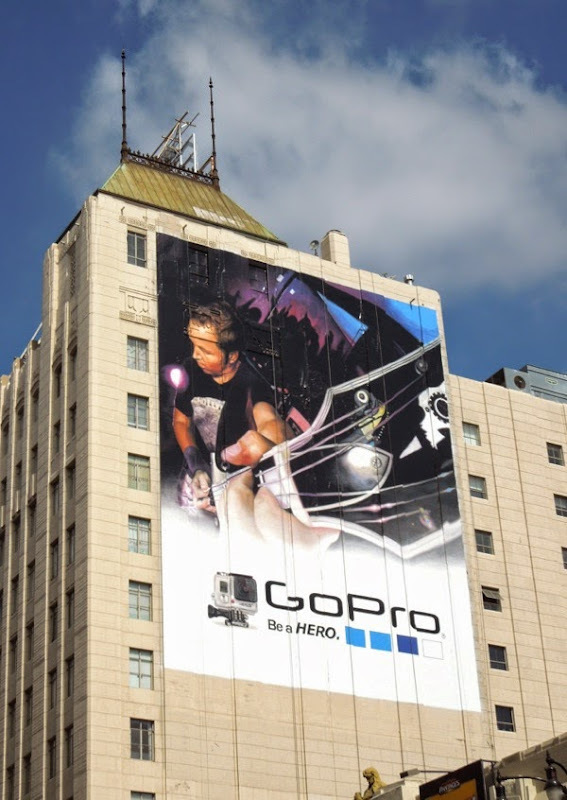 Since selling its first camera in 2004, GoPro have been the go-to brand for adrenaline junkies filming their extreme sports exploits like surfing, skiing and skydiving. 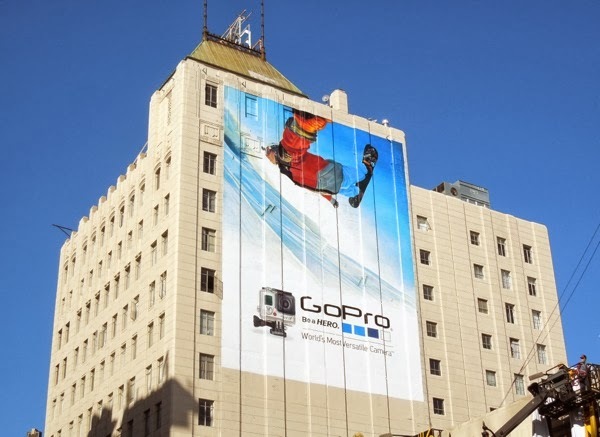 Let's face it, if you're going to indulge in these high-octane activities, you want the best equipment to capture your experiences, especially in this world of social media sharing. 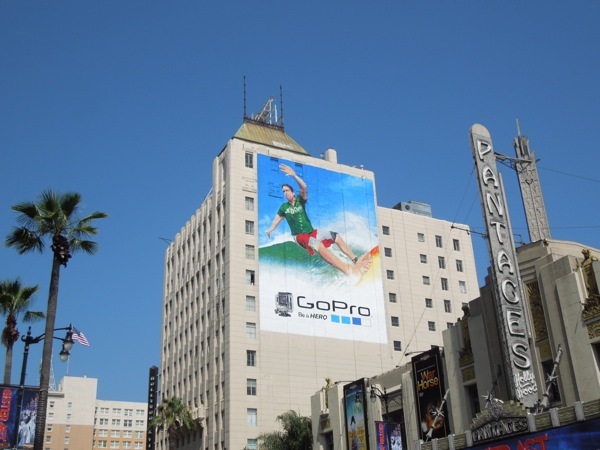 This giant surfer billboard certainly does the job of capturing what this video camera product is all about. 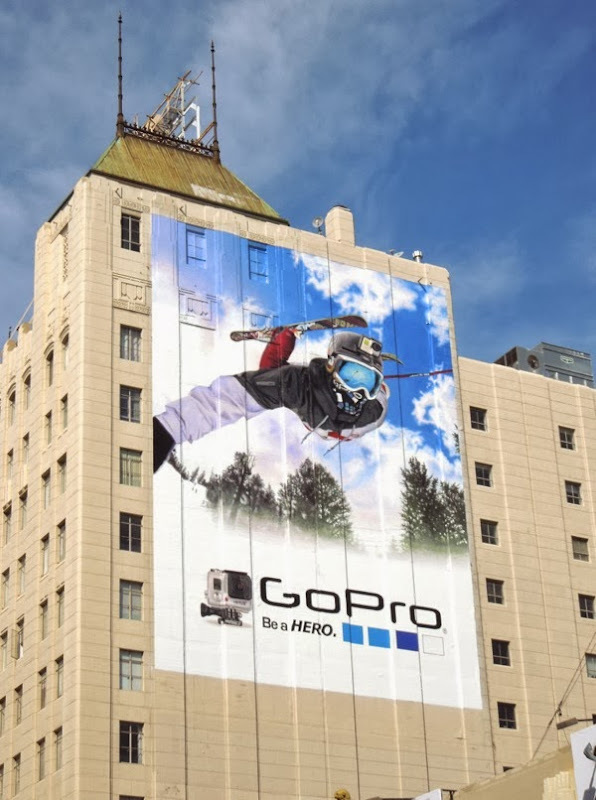 UPDATED: Just in case you missed the fact that GoPro cameras are for extreme sports enthusiasts, here's a breathtaking snowboarding ad creative to remind you. 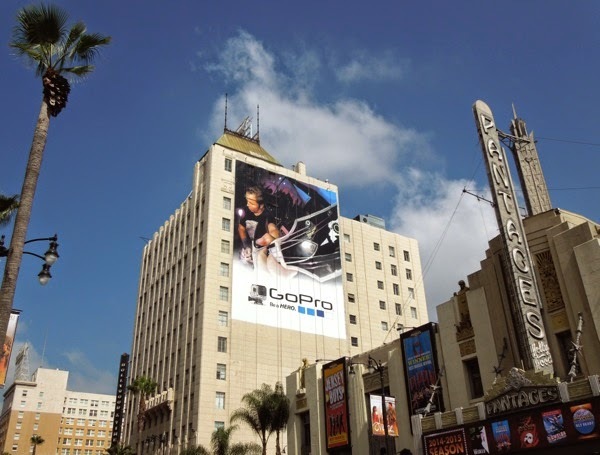 This giant-sized wall mural was spied in the same Hollywood Boulevard location as the previous surfer creative on November 11, 2013. UPDATED: So far GoPro has featured surfers and snowboarders on this giant ad site in the heart of Hollywood, and now it's the turn of skiers to show off their skills. 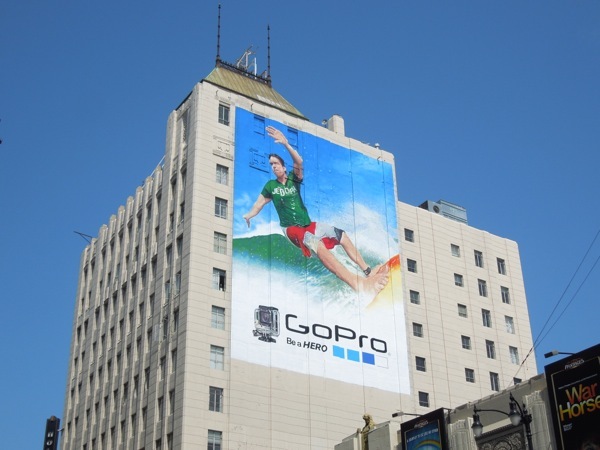 This super-sized sporty ad creative was photographed on March 5, 2014 in the same location as the others for this 'Be a Hero' campaign. 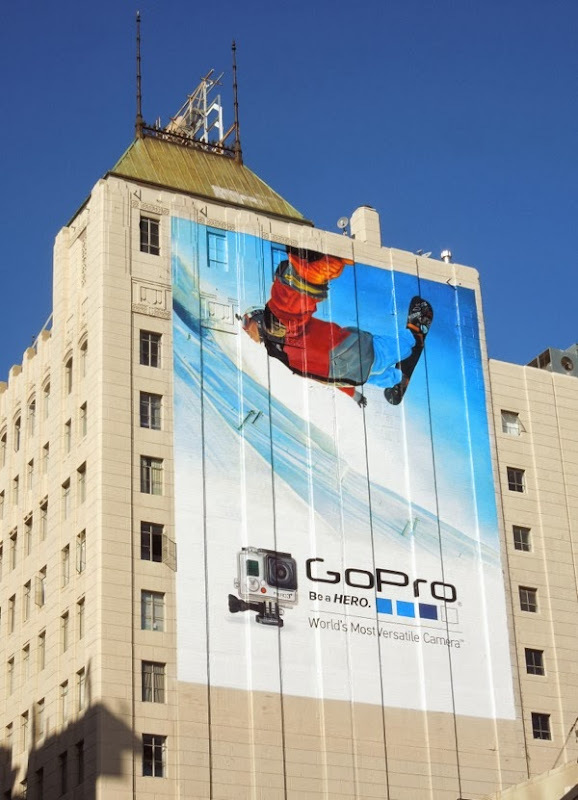 It begs the question what's next - skydiving, skateboarding? 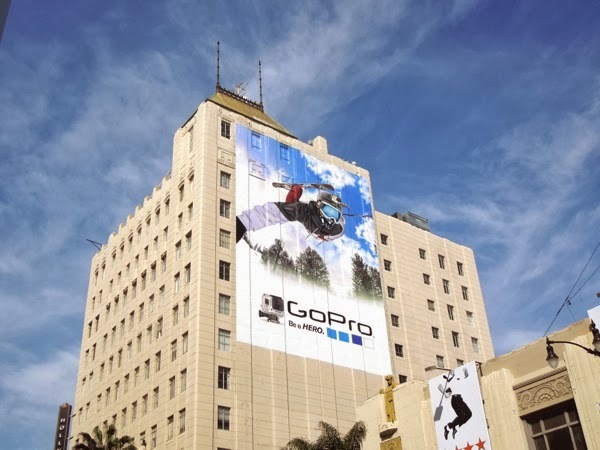 UPDATED: Here's the latest massive ad creative for GoPro, this one suggesting that there's more to the versatile video camera than just extreme sports. 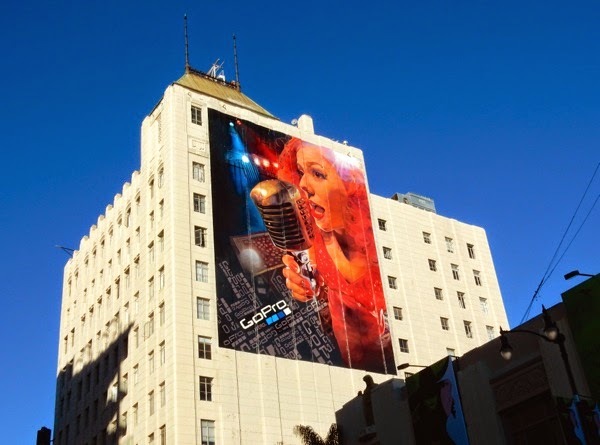 This giant guitar playing billboard was spied in the same Hollywood Boulevard ad location on June 27, 2014. 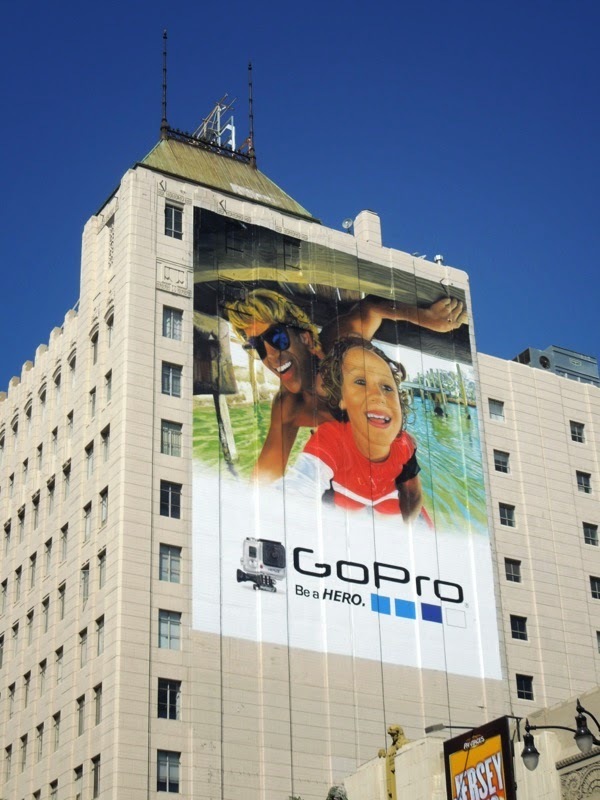 UPDATED: And here's the latest creative for the 'tech toy' which everyone seems to have at the moment on their telescopic poles and be posting photos from on social media, so GoPro's advertising is obviously working. 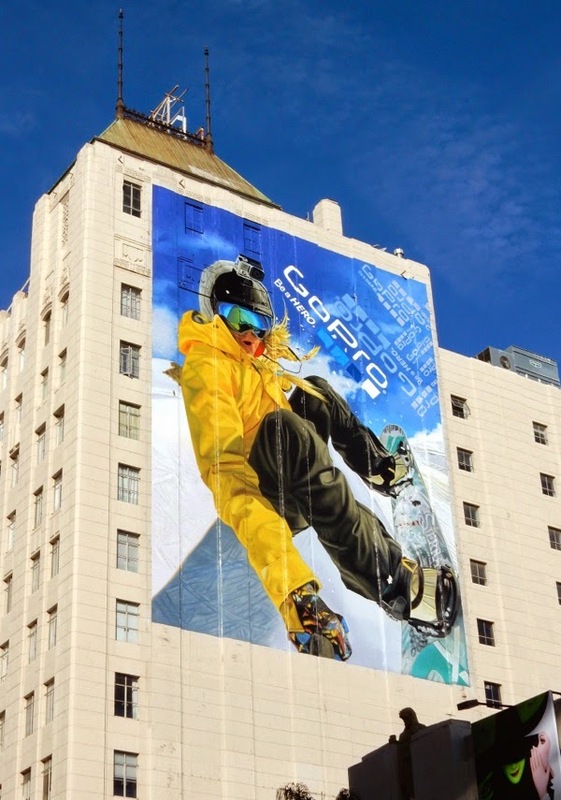 This giant sporty father and child wall mural was photographed on September 18, 2014 in the same Hollywood location. 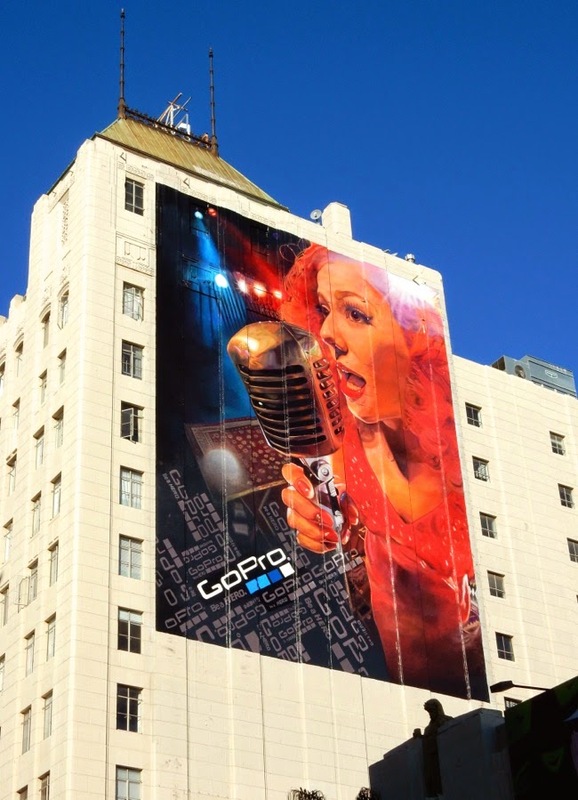 UPDATED: GoPro continue to dominate this giant wall mural space in Hollywood in the New Year, with a fresh singer creative, further expanding the camera's uses beyond extreme sports. 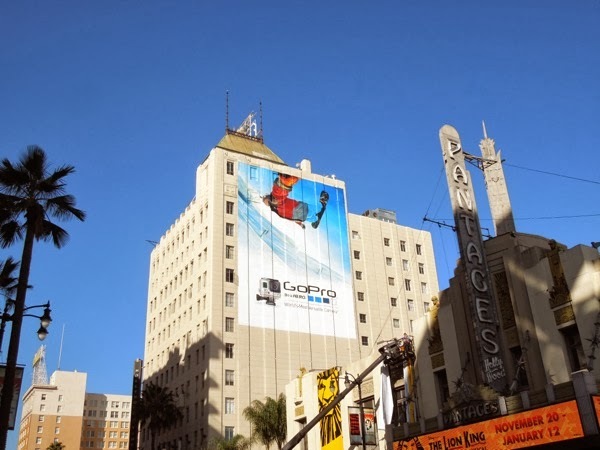 This colourful giant billboard was snapped westbound above Hollywood Boulevard on January 15, 2015. 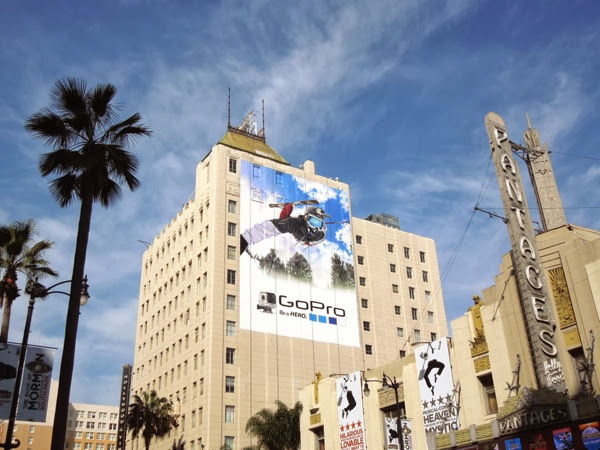 UPDATED: Here's the latest sporty snowboarding billboard for GoPro's cameras snapped in the same Hollywood location on February 11, 2015.